She is the recipient of a record six David Di Donatello awards for Best Actress, a Grammy, five special Golden Globes, an Academy Award in 1962 and an Honorary Academy Award in ’91, and Cecil B. DeMille Lifetime Achievement Award, in 1995. As one director said, ‘Sophia is perhaps the only movie star who has never forgotten where she came from.’ Wonderfully human, devoid of glamour and downtrodden in de Sica’s classic wartime tearjerker La Ciociara (Two Women), she was the first Oscar-winning actress for a foreign language film. Though Sophia Loren turned 80 this month, astonishingly, nothing much has changed. In the fickle world of showbiz, she maintained her one and only 50-plus-year marriage. She works when she wants to; she dotes on her children and grandchildren; she appears regally at red carpet events. Looking every inch the naturally glamorous movie queen – from still enviable hourglass figure to heels – she eclipses so-called stars half her age. She is the ultimate role model not just for older women, but perhaps Everywoman. Buon Compleanno, Sophia ! Volterra is somewhat like a womb of history. 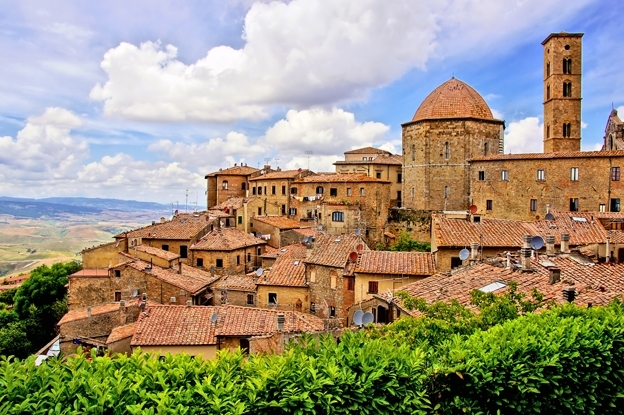 It has nurtured the original Etruscan settlement as far back as the 8th century BC and later it was occupied by the Florentines, the Medici family and then ruled by the Duchy of Tuscany. Evidence of all is to be found within the walls of Volterra. There are numerous museums, galleries and ancient ruins. At the Teatro Romano, there are ancient Roman baths on a deep slope with an arena and columns. It is an incredible excavation in its dimensions, leaving one with a sense of awe at the view of life in Roman times. The Archaeological Park E. Fiumi, an Etruscan site, is still being explored and the Etruscan urns, pots and interesting artifacts line the walls of the museum. Volterra has been mining alabaster since at least the 7th century BC. Its hardness is rated at 2 and 3 on the Mohs scale, alabaster being hydrated calcium sulphate. Alabaster has been used both practically by the Etruscans for their cinerary urns and artistically for alabaster ornaments, lamps, vases, bowls and podiums which are still being made. Right at the top of the city looms a massive fort, Fortezza Medicea, making this ‘flying city’ seem even higher than it is. Winding roads and a new landscape at every turn, a sense of wonder and anticipation heightens the senses as one approaches Volterra. At night the city lights, seen from the air, make it look like a massive ship sailing on a sea, a dark sea of hills below. There is only one way in and one way out for a vehicle entering the city. It is enclosed within a wall with stone arches as gates, the roads are narrow and the history glows in this timeless place. Today’s Volterra has wonderful shopping: alabaster, olive wood, paintings and leather spill out from shop entrances into the ancient streets which are lined with fascinating doorways and shuttered windows, and an aroma that can only be found in Italy. Restaurants both formal and informal call from the main streets, but they can also be found tucked away in extraordinary places, by following the delicious waft of herbs and spices. The menus are diverse, but in all you will be offered Tuscan cuisine; a must-try is wild boar cooked with olives and served with black fava beans. Because of its relative closeness to Pisa, fresh fish is also part of the local cuisine. The city can captivate the tourist for days and if, at any time, one feels the need to escape the walls, then a few miles drive to San Gimignano, Siena or Cecina on the coast provides more historical delight, more beautiful views, vineyards and horizons with silhouetted cypress trees, so typical of Tuscan landscapes. Get there on an early boat and you are almost certain to see the ladies of the island sweeping and wiping down their immaculate house fronts. Little brooms and polishing equipment ‘decorate’ many a façade along with ‘buntings’ of white linen which are draped neatly across homes and the little squares linking the narrow passages. The fogher or hooded fireplace gives interest to the outer shape of many of the walls, whose typical Venetian windows are ‘framed’ with a white band. 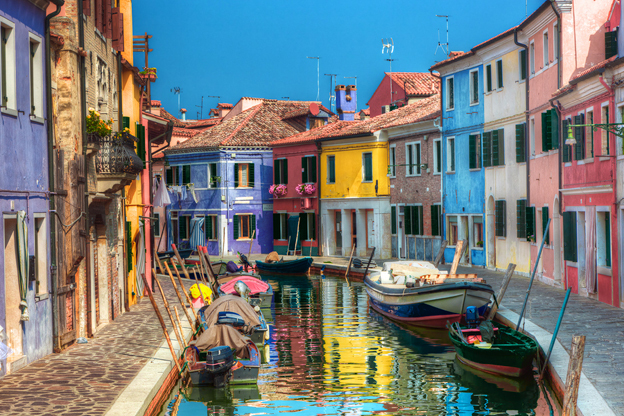 Archeological evidence has shown that early settlers have inhabited Burano since before the Roman colonization. They were fishermen, salt gatherers and farmers, all well versed in navigation. Burano’s naturally sheltered position and its detachment from the mainland meant these original lagoon dwellers were protected from invaders and plagues of malaria which were normal in the other islands. Inhabitants over the centuries raised the ground, dug canals and built bridges to transform a swamp into a hospitable place.The island is approximately seven kilometres from Venice and has always been closely connected to it by its shared past in good and bad times. It was occupied by French and then Austrian troops and contributed its own heroes to the ill-fated 1848 revolution led by Daniele Manin. In 1866, it joined the kingdom of Italy together with the whole of Veneto and became a township of the Municipality of Venice in 1923. It has long been associated with lace, first produced by nuns in the 15th century, and then taken up by fishermen’s wives. Visit the museum and admire the intricate work of these nimble fingered lace-makers or you can browse the little stalls and small shops along the canal paths into the main square, Piazza B. Galuppi, dedicated to a famous Italian musician born in Burano named Baldassare Galuppi (1706-1785). Tapestries, jewellery, linen and other quality items are on display, but there is no ‘hard sell’ and it is so relaxing to sit with a caffé latte in the one bustling thoroughfare that Burano possesses. Seafood is another good reason to visit Burano, as there are many excellent restaurants serving typical local dishes mostly centered around the main piazza. 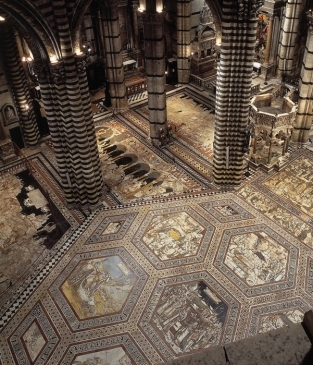 The extraordinary inlaid marble mosaic floor of Siena’s Cathedral was unveiled on August 18. Normally covered by carpets for protection, the floor that Giorgio Vasari called “the most beautiful, grand and magnificent” will reveal its marble intarsia works of art that took centuries to complete, beginning in the 14th century and ending in the 16th, with about 40 artists working on it. The floor consists of 56 panels of different sizes, representing sibyls, scenes from the Old Testament, allegories and virtues. Visitors will also be able to admire the floor from high above by accessing the Porta del Cielo (Gateway to Heaven) at the very summit of the church (reservation required). The floor will remain uncovered until October 27.